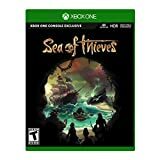 Rare’s long awaited Xbox One and Windows 10 online high-seas adventure title, Sea of Thieves, is just a few days away from release and finally we have a new gameplay trailer showing off what to expect from the finished product. Besides the high-seas hijinks we get a look at the killer kraken which appears to be lurking just below in advance of the March 20th, 2018 launch. It’s almost here! Sea of Thieves launches on Xbox One and Windows 10 PC on March 20th, 2018. Pre-order now at https://www.xbox.com/seaofthieves. Stop back next week for our coverage of Sea of Thieves.